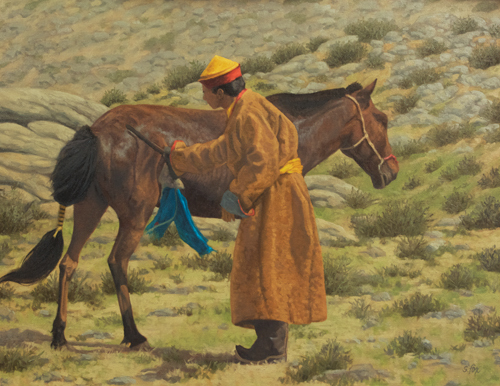 When traveling in Mongolia, one often sees the herders out taking care of their animals. Often they’re wearing western clothes, but a lot of them wear del, the traditional long garment. It’s very practical and makes them look very dashing. What isn’t quite so dashing are the ubiquitous baseball caps, however inexpensive and practical they are. So when I was at a mountain blessing ceremony at Bag Gazriin Chuluu and was walking around after the horse race, this gentleman really stood out with his red and yellow hat. 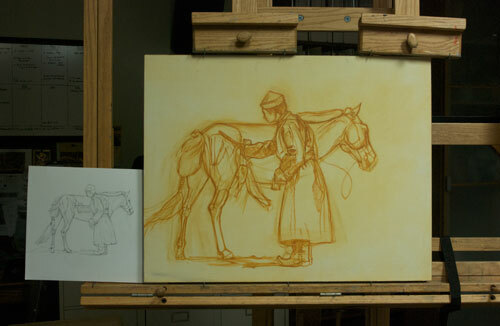 I have no idea who he was, but he was scraping sweat off one of the horses with a special blunt, flat blade. I believe the sweat from a winning horse is considered to have the strength of that horse in it and so is very auspicious. 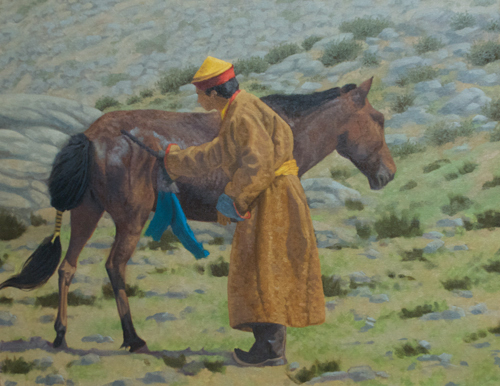 The blue scarf is a khadak, which is used for offerings. Major Juried Show News! Accepted Into Art And The Animal! Wow. Simple progression photos, including of your studio setting and work tool iMac. I learn from the best. Incredible work, Susan. Thank you for sharing “how” you create your piece. The art looks beautiful but the real person is in the photo is wearing buddhist monk dress. As religious consciousness dictates that monks or priests should not possess on own wealth. In possible christian eyes it looks exactly same as an american priest polishing own Mercedes Benz seen. The christians pretty much won’t care this seen but anyone who has some buddhism knowledge would very likely scrutinize this seen. Well I mean there not few bad buddhist monks in Mongolia as you have in america some crime commiting christian priests getting discovered every while. So the portraid monk in the art is at least not well responsible monk. Barimalch- Than I have made a bad error because i did not understand what I was seeing. 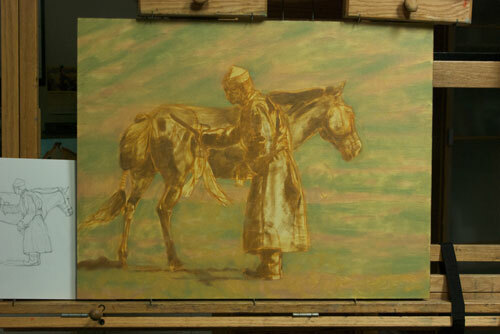 There were two other Mongols in the photograph I used. They were standing with the horse and I think it was their horse. So the monk was maybe doing this for them and not for himself? 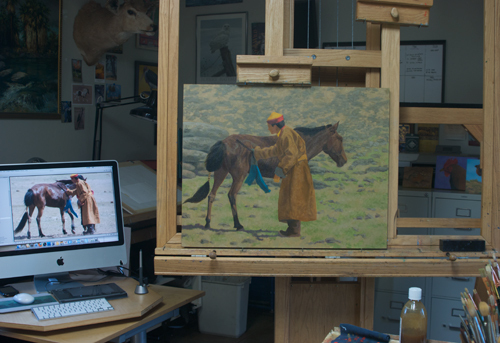 I left them out of the painting because they were wearing western clothes. I believe I can put one of them back in, behind the horse. Would that correct the wrong impression? You have helped me very much with your comments. 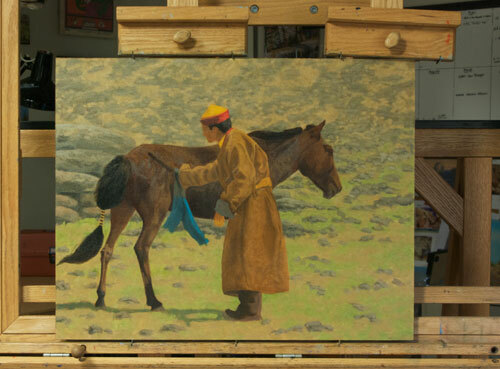 They are a very useful reminder that if I am going to paint the people of Mongolia and their customs then I have much to learn and must find out the meaning of what I am seeing before I paint a picture. This sweat scraping is primarily owner’s kind of honor job. I hope you’ll improve your art background research next time for these types of cultural seens. A further question- both the other people in the photo were women. Is the sweat scraping something only men do? If so, is this something they might have asked him to do for them? He was clearly part of the local community and seemed to know everyone. But this should give lesson to numerous artists who read your blog that background research is important to avoid accidents. If two women and 1 monk stood with the horse and he was scraping means double proof of the horse is his. 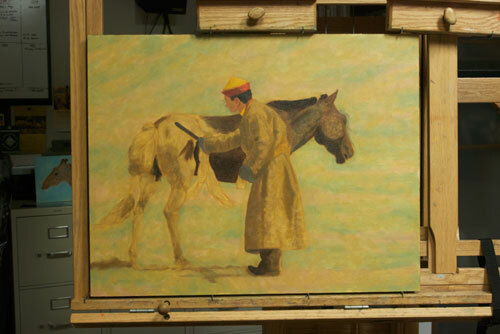 Horse racing and this sweat scraping is 100% man’s job in Mongolian culture. That’s what I suspected. Well, I hope to go back to that place this summer. I will take the photos, show them to a few people there and see what I can learn. But I think your point was that a Buddhist monk should not be owning horses or racing them. My point was either buddhist monks or christian priests supposed to help people or lead community goodwill service rather than fancying around with personal wealth. So a few monks drive fancy cars or racing horse possible happen in Mongolia today and many of really simply accuse that kind of thing. I guess in america not many priests would drive Mercedes Benzes or rollce royces despite american platinum clubs or high class platinum community priests. So a few monks in mongolia drive fancy cars or racing horses today and many of us really simply accuse that kind of thing. Stealing public religious donations and fancy around is a moral crime. Ok, I see what you are saying. Stealing religious donations and using them for personal luxuries instead of the intended purpose of helping people is wrong. I agree with that. I hope that is not a big problem in Mongolia. And yes, I hope that my artist friends who read this will appreciate the importance of doing their research when painting people from other countries. We see something wonderful when we travel and want to paint it very badly, but forget that we don’t always understand what we have seen.